Mexican President Enrique Pena Nieto at the 8th National Forum for Security and Justice, Mexico City, June 7, 2016 (AP photo by Rebecca Blackwell). The results of Mexico’s local elections on Sunday, June 5, represent a nadir for President Enrique Pena Nieto and the dawn of his administration’s long exit. 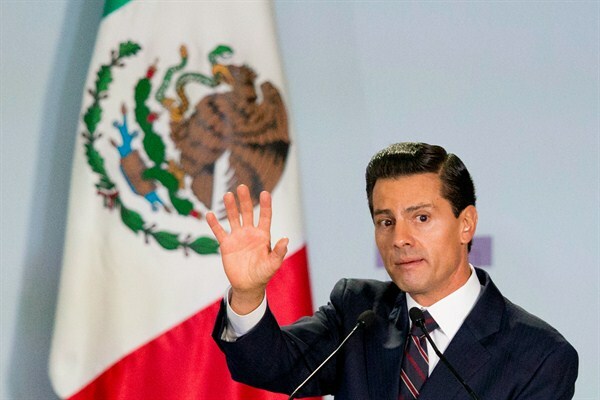 Pena Nieto’s Institutional Revolutionary Party, or PRI—the erstwhile hegemon that he led back to power after more than a decade in the opposition in 2012—lost seven of Mexico’s 12 gubernatorial races, which were the centerpiece of the day’s contests. While that may not sound like much, the PRI dramatically underperformed both its leaders’ and most pollsters’ predictions. This leaves the party in charge of just 15 of Mexico’s 32 states, its lowest number since the party was founded in 1929. Four of the states that voted for the opposition—including Veracruz, the third-most-populous state in the country—had never previously rejected a PRI candidate for governor.